Minister of Institutional Security Augusto Heleno, is seen before a meeting at the Secretariat of Security and Coordination Presidential Cabinet in Brasilia, Brazil, Jan. 3, 2019. 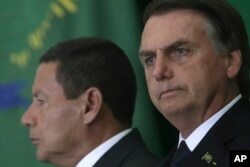 Brazil's National Security Adviser Augusto Heleno said on Tuesday that right-wing President Jair Bolsonaro had not offered to host a U.S. military base or American soldiers on Brazilian soil. "He told me he never said that. It was a comment he made when talking about the Russian base (in Venezuela) and then suddenly this came out that it was an American base," Heleno told reporters after a cabinet meeting. Brazil's President Jair Bolsonaro and his Vice President Hamilton Mourao attend a ceremony during which the country's government bank presidents are presented at Planalto presidential palace in Brasilia, Brazil, Jan. 7, 2019. The seemingly contradicatory messages and apparent backsliding over the possible U.S. base highlight the fragility of Bolsonaro's cabinet, which is comprised of statist former generals, right-wing nationalists, Chicago-trained economists and Christian conservatives, all of whom with different priorities. Brazil's Foreign Minister Ernesto Araujo, center, attends a meeting of the Lima Group concerning Venezuela in Lima, Peru, Jan. 4, 2019. The Folha de S.Paulo newspaper on Tuesday reported that Bolsonaro had backtracked on the idea, and that Defense Minister Fernando Azevedo had informed military commanders of the president's decision. The story cited unnamed generals who received the message. Even the defense minister said he sees no reason to allow the United States to set up a military base in the country. "This needs to be carefully evaluated. I don't see what the reason is for such a base," Azevedo, a retired army general picked by Bolsonaro, told the financial newspaper Valor Economico. Pompeo told reporters on Wednesday that the United States and Brazil had "an opportunity to work alongside each other against authoritarian regimes" in the region, naming Venezuela, Cuba and Nicaragua.